But no doubt if you’ve come across this system you’ll likely be sceptical about the whole thing & you have good reason to be… So what’s the truth about it? Is it legit & can you really make money with it – or is Get Money Relief a scam that’ll just ultimately see you spending money rather than actually making it? What Exactly Is The Get Money Relief System? As I briefly touched on above the Get Money Relief system is a newly launched website claiming that it contains the answer to helping you generate a full-time income online from the very comfort of your own home. But I’ll point out right from the off that you shouldn’t get too excited about the whole thing because it’s actually nothing but a scam that’s set out to part you with your cash rather than help you make it. And how can I be so sure about that you’re probably wondering… Well the answer is easy, I’ve seen this exact same scam before launched under the name Cash Relief Now & they’ve simply tried changing their name in an attempt to escape the negative reviews so that they can try to continue scamming people. The website is still the same & so is the “method” they provide you with… It’s all total BS. How Does The Get Money Relief System Work? Well the first thing I want to point is that clearly the Get Money Relief system doesn’t work as promised – despite claiming it will help you make thousands the system won’t help you make so much as a single penny. That’s because the whole thing has been purely designed to make it’s creators wealthy at your expense. The people who’ve put it together don’t really care about your success at all, they’re just set out to make themselves a quick buck. So you’ll initially sign up expecting to receive an easy way to quickly make lot’s of money online but instead you’ll find that you just get provided with a “taster” which briefly explains about affiliate marketing. And I’ll point out here that affiliate marketing in general is actually a legitimate & very good way to make money online. It’s basically were you promote products for 3rd party companies & receive commissions in return on any sales that you manage to generate. 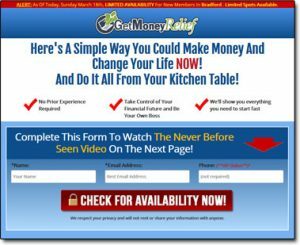 The problem though is that the training provided through the Get Money Relief system as I mentioned above is really just a “taster” – it won’t help you get started at all. Instead it’s just designed to get you even more hyped up about it so that you’ll be more likely to purchase the upsells that they then push onto you inside. Then if you do happen to follow the program right the way through you’ll finally be redirected through into a program named MOBE, an entirely different business opportunity altogether. The reason you’re pushed through into this is because the creator of the Get Money Relief system is affiliated with it meaning he (or she) will earn even more commissions if you decide to sign up… And these commissions will be pretty substantial as MOBE could see you spending as much as $50,000! Yes that’s not a typo – if you get involved with this thing you could potentially be spending over $50k before you even manage to get the ball rolling. So it should be easy for you to see here that the people behind the Get Money Relief system aren’t really interested in your success at all, they’re just looking to squeeze as much money out of you as they possibly can. There’s absolutely no reason you should ever be spending that level of money just to get started online – not when there’s plenty of free & legitimate programs like Wealthy Affiliate around which provide you with everything you need. My Verdict – Is Get Money Relief a Scam? Yes, in my opinion the Get Money Relief system is indeed a scam. It’s extremely misleading & as far as I’m concerned it’s been purely setup to make the creators wealthy at your expense so don’t get drawn in by their tricks. Whilst the internet does provide you with many legitimate ways to earn money online, it’s not magical & there is nothing online that will see you earning lot’s of money so easily… Anything that promises it is likely trying to scam you. If you really want to make good money online then you must be prepared to put in the work required to make it happen. If you are prepared to put in the work though then the good news is that as mentioned above there are legitimate programs out there like Wealthy Affiliate for example that you can get started with for free to learn what you need to do to begin making money. Therefore overall I am not going to be personally recommending the Get Money Relief program because I firmly believe that rather than giving you money relief it will give you nothing but money headaches as it will much likely see you spending more than you ever manage to make back. 5K Formula System – Scam or Legit? Read My Honest Review Before Joining! The Tube Crusher Scam – OMG Is This Some Sort of Joke? My Review Exposes It!